Abdominal aortic aneurysms (AAAs) represents 65% of all aneurysms of the aorta and 95% of them are below the renal arteries. It has a male preponderance of 4:1. ,, Smoking is the greatest risk factor for AAA and 90% of the patients with this disorder either smoke or smoked. Other risk factors include hypertension, hyperlipidemia, and family history of aneurysms, inflammatory vasculitis, and trauma. Atherosclerosis is also etiology of aneurysm and other less common causes include the defect in fibrin I (Marfan's syndrome) and a rare condition causing changes in the type-III pro-collagen. (Type-IV Ehlers-Danlos syndrome) Over the last decade, the practice of aortic aneurysm repair has undergone immense modifications from the conventional open reconstruction to minimally invasive incisions as well as percutaneous techniques. This possibly has resulted in the reduction of morbidity and mortality as compared with traditional open techniques. Endovascular aortic repair (EVAR) was pioneered by Parodi et al. and Volodos et al. in the early 90s. Since then EVAR has become a popular alternative to the conventional open repair. The endovascular procedure requires a multidisciplinary team composed of vascular surgeon, interventional radiologist and anesthesiologist. 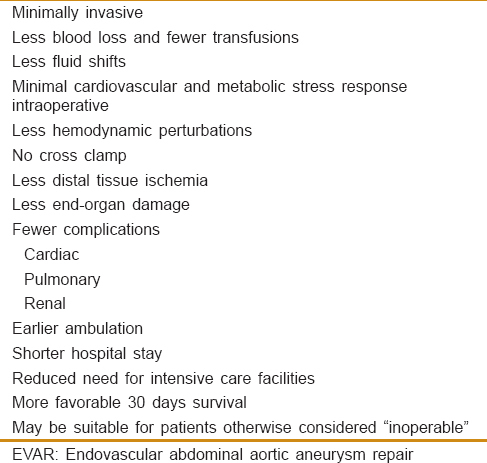 The advantages of EVAR compare to open surgical procedure are listed in [Table 1]. However, EVAR is more expensive and its long-term success is still uncertain. Furthermore, not all patients are suitable candidates for EVAR, and the patient selection must take into account the surgical risks of open repair in patients with significant co-morbidity. Many AAA are discovered incidentally whilst investigating for back pain or urinary symptoms in the middle-aged population. Routine abdominal ultrasonography commonly accounts for the unexpected detection of aortic aneurysms. Once discovered, the decision to operate is based on the symptoms and size of the aneurysm. Patients are usually offered surgery once the anteroposterior diameter reaches 5.5 cm (or aneurysm increasing by more than 5 mm in 6 months), as the risks of rupture increase considerably beyond that  [Table 2]. The elective open AAA repair carries a 5% mortality. Whereas the 30 days mortality associated with ruptured AAA is widely believed to be around 80%; and of those that reach hospital alive and undergo emergency surgery, approximately 40% will die within 30 days of surgery. Statins  and doxycycline  have been proven to slow down the progression of AAA in animal studies (but have not been shown in humans); as such surgery remains the only treatment option. In recent years, there have been two large randomized trials comparing the outcomes following EVAR and open repair. , In the EVAR 1 trial, patients who were considered fit for open repair were randomized to either EVAR or open repair. Aneurysm related short-term mortality and morbidity were found to be 3% lower in the EVAR group but the long-term mortality was similar in both groups. However, the trial demonstrated an increased need for re-intervention (4%) and the increased cost per case in the EVAR group. Complications that require re-intervention are endoleak, thrombosis, kinking of the graft, and device migration. The EVAR 2 trial randomized patients considered unfit for open repair to either conservative management or EVAR (to assess if EVAR is a viable alternative in patients deemed unfit for open repair). The results of the EVAR 2 trial were disappointing in this respect. EVAR had considerable 30 days mortality (9%) and the long-term survival was no different in both groups. Mortality from all possible causes after EVAR as compared with open repair was similar in the 4 years follow-up in EVAR 1. Similar conclusions were drawn from the mid-term results of the Dutch randomized endovascular aneurysm management trial (DREAM trial). Nevertheless, the DREAM trial suggested that "if the developments in endograft technology and imaging continue to gather pace, EVAR may become the first choice operation for all the patients with aortic aneurysms." EVAR involves the use of fabric or synthetic tube grafts which is self-expanding or a ballooning catheter is used to expand the graft. The stent grafts can be classified as the "standard" stent grafts and the "complex" stent grafts. The "complex" stent grafts can be fenestrated [Figure 1], branched [Figure 2], or chimney [Figure 3]. During the procedure, the stent graft is positioned under fluoroscopic guidance overlying the aneurysm such that blood flows from the normal artery through the stent graft into the normal artery thus preventing blood flow in the aneurysmal sac, which will eventually thrombose. Stent grafts are usually introduced through the common femoral arteries. Occasionally, stents are inserted through the brachial or subclavian artery. Most surgeons will perform a surgical cutdown on the vessels due to the size of the sheaths. Closure devices such as Perclose Proglide (Abbott vascular) are used in many centers but the risk of groin complications is higher with these devices. Stent grafts are compressed in an outer sheath with a pusher rod at the distal end. 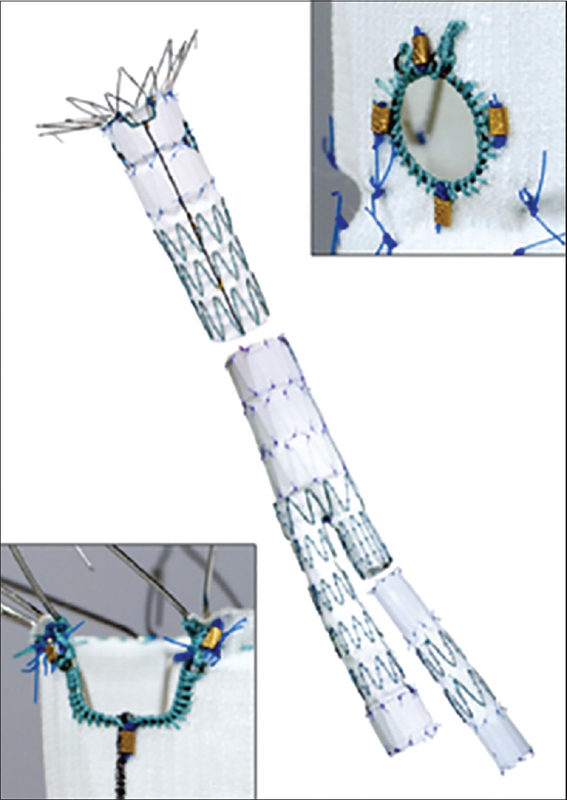 When the sheath is withdrawn backward over the pusher rod, the stent-graft is exposed and opens as a result of the radial force of the self-expanding stent. After stent deployment and position confirmation, the proximal and distal ends of the graft are sealed to the aortic wall by a nonoccluding endoluminal balloon. The use of more complex grafts or increased number of fenestrations requires more skilled proceduralist and it can also increase the procedural time significantly. Experienced surgical teams have been shown to have fewer complications. The fluoroscopy time and dose of contrast used also tend to be higher which increases the risk of contrast-induced nephropathy (CIN). The comprehensive assessment process should be tailored to the surgical urgency, complexity of aneurysm anatomy, co-morbidities, and functional status of the patient. The cardiac assessment should follow the ACC/AHA or the European guidelines on perioperative cardiovascular evaluation for noncardiac surgery, with referral to the cardiologists as indicated. There is no single useful risk stratification model for vascular surgery to date. Some anesthesiologists use risk scores such as the revised cardiac risk index  and/or the modified customized probability index  when risk stratifying patients for endovascular surgery. Nevertheless, the sensitivity of these indices as predictors of mortality after elective aortic surgery is not high, but they perhaps show more promise in the identification of low-risk patients. Therefore, the focus of assessment should be to anticipate long-term survival with improved quality of life. The patient's smoking history and chronic changes on chest X-ray are evidence of chronic obstructive airway disease [COPD]. If there are severe signs and symptoms of COPD, arterial blood gas (ABG) analysis can be helpful. It gives information on the oxygenation and ventilation of the patient. A preoperative ABG is also helpful in guiding intraoperative ventilator management and predicting the likelihood of postoperative mechanical ventilation. Those with severe respiratory disease might require preoperative lung function testing. For those with COPD, the practice of small groin incision, use of regional or local anesthesia and early ambulation are likely to reduce the risk of pulmonary basal atelectasis and respiratory infections. Although respiratory failure is not as common after EVAR, a significant number of patients still suffer from postoperative complications  (10.9% after open repair vs. 2.9% after EVAR). As a general rule, it is advisable to convert those on short-acting beta-agonist to longer-acting agents in the perioperative period to minimize the potential problems related to withdrawal of shorter acting agents. Chest physiotherapy interventions such as incentive spirometry are useful adjuncts in minimizing postoperative pulmonary complications. These patients are at high risk for acute kidney injury postoperatively for a number of reasons, namely the use of intravenous (IV) contrast and para-renal stents, increasing age and multiple co-morbidities, complexity of EVAR, perioperative dehydration, as well as medications such as ACE inhibitors, aminoglycosides, and diuretics in the perioperative period. EVAR should be conducted in a specialized radiology suite (special anesthetic considerations needed for remote-site anesthesia) or in a hybrid operating theater with appropriate angiography facilities and the ability to convert to an open procedure if required. All necessary precautions should be undertaken to protect theatre staff from ionising radiation with the appropriate measures (lead aprons, thyroid shields, and protective screens). Apart from the standard monitoring, measurement of invasive arterial pressure (enables ABG monitoring and should be inserted contralateral to the upper limb surgical access, which usually is the right hand), hourly urine output and core temperature is mandatory. A 5-lead electrocardiogram should be applied to detect ischemic ST changes. Large bore venous access should be inserted as there is potential for significant blood loss  if conversion to an open repair (<2%). All IV tubings and monitoring cables should be of sufficient length. Central venous access should be considered in complex or long procedures. The availability of near-patient testing of hemoglobin, glucose, lactate, and coagulation such as ROTEM thromboelastometry (Tem International GmbH) is useful in providing frequent intraoperative measurement of the parameters, especially in complex or ruptured EVAR. Evoked potentials monitoring is sometimes requested if there is high risk of spinal cord ischemia (SCI) during the operation. The main goals for intraoperative anesthetic management are: (a) To provide hemodynamic stability, and preserve perfusion to vital organs including the brain, heart, spinal cord, kidney, and splanchnic vessels (b) to avoid imbalance in myocardial oxygen supply and demand (c) maintenance of intravascular volume and early identification and management of bleeding (d) normothermia. There is very limited evidence on the best choice of anesthesia for standard EVAR and even less for complex EVAR. The literature is limited to descriptive, retrospective studies on patients undergoing infra-renal EVAR and is open to selection bias and should be interpreted cautiously. ,, Hence, the selection of techniques falls to the choice of the patient and anesthesiologist and should take into consideration the experience of the vascular team, choice of procedure, complexity of the aneurysm, and premorbid state of the patient. The ACC/AHA does not advocate a specific mode of anesthesia for patients with cardiac disease as the evidence base has not been substantiated. Endovascular repair can take between 4 and 12 h and the patient comfort is difficult to achieve under regional anesthesia, especially when the arterial access is often required from axillary, femoral, and occasionally subclavian arteries, any technique other than general anesthesia is likely to be very difficult for all concerned. Although conversion to open repair rates are low (<2%), the anesthesiologist needs to be prepared for open repair and massive bleeding. There should be an immediate access to rapid infusion devices. Patients are cross-matched the same as for open repair. The use of air warming devices and IV fluid warmers is strongly recommended as the duration can easily exceed 4 h and large volumes of fluids occasionally need to be given. Use of iliac bifurcated devices or complex fenestrated grafts and or concomitant open surgery like femoro-femoral crossover graft may take lengthy periods of time, which may be tolerated poorly by some patients. Most of the patients are administered 5000 IU of IV heparin after the cannulation of the access vessel. We must check activated clotting time baseline, 3 min after heparin and every 30 min thereafter. Activated clotting time should be maintained at 2-2.5 times the baseline (approximately 200-250 s). Reversal with protamine might be required at the end of the procedure. Unless aortic occlusion balloons are used (usually in ruptured aneurysms), hemodynamic instability is usually minimal. Persistent hypertension is best managed with a beta-blocker such as metoprolol or labetalol. Immediate control of hypertension is easily managed with nitrates and/or short-acting beta blockers. Hypotension is common after induction of anesthesia, as the magnitude of surgical stimulus is small. Infusion of low-dose vasopressors such as phenylephrine is often required. SCI is a devastating complication of EVAR. SCI either immediate or delayed ,,,, has been reported in EVAR with an incidence of 0.21%,  but it is more common in complex as well as ruptured EVAR. The largest collateral artery, the artery of Adamkiewicz (which supplies most of the anterior spinal arteries and hence perfuses the anterior third of the spinal cord) arises from the aorta anywhere between T5 and L3 but most commonly from T9 to T12, so it is more at risk from occlusion with stent grafts which extend suprarenally. ,, Collaterals to the spinal cord also arise from the internal iliac, inferior mesenteric [IMA], and middle sacral arteries. The IMA is invariably occluded during infra-renal EVAR. Long stent grafts will occlude more of the thoracic and lumbar collateral arteries to the spinal cord. The mechanism of SCI is crucial coverage of feeder vessels following stent deployment. Preoperative imaging of these vessels to identify those at risk is challenging. Clinical usage of fenestrated or branched endografts preserving feeder vessels has yet to be demonstrated. The pathogenesis of SCI in EVAR has not been fully elucidated, although perioperative hypotension, prolonged aortic occlusion, and micro-embolism of atheromatous material into the collateral arteries are proposed contributory factors. Factors increasing the risk of micro-embolism include a prolonged procedural time (>150 min), extensive intravascular manipulation of catheters and perioperative embolization of hypogastric and lumbar arteries. Patients who had previous AAA repair are also at greater risk of SCI. The therapeutic strategies includes CSF drainage, hypothermia, steroids and arterial pressure augmentation. Spinal drains have been shown to be efficacious in prevention and reversal of SCI in open repairs where there is a much greater incidence of ischemia. Spinal drainage of CSF can be used to prevent or treat SCI, by increasing the perfusion pressure to the spinal cord. Preoperative spinal drains are occasionally inserted for complex abdominal EVAR if the patient is thought to be at particularly high risk of SCI. Postoperatively, spinal drain can be considered should neurological problems develop. The other strategies to prevent SCI are moderate hypothermia (local and systemic) and femoro-femoral bypass. However, the only definitive methods of preservation are short procedural time and the maintenance of adequate cardiac output. Postoperatively these patients require high dependency or Intensive Care Unit for continuous invasive blood pressure monitoring, regular measurements of blood gas, hemoglobin, serum electrolytes and coagulation parameters. Regular lower limb arterial assessment both clinically and with Doppler is crucial. Patients are usually allowed to eat or drink on the same day; however, continuous IV fluid therapy is encouraged to reduce the likelihood of CIN. The pain is usually minimal and can be managed with simple oral analgesics or titrated doses of opioids if required. Postimplantation syndrome is a common but usually benign complication observed after EVAR. It is characterized by pyrexia, leukocytosis and elevated inflammatory markers. Clinically it manifests like sepsis, but without any evidence of infection. Serious life-threatening complications such as multi-organ failure and coagulopathy may occur but are rare. Exclusion of larger aneurysms with endografts may result in significant fibrinolysis secondary to thrombus generated within the aneurysm sac leading to a state of coagulopathy. Majority of cases of postimplantation syndrome are self-limiting and usually settle within 2 weeks of surgery. However, it is important to exclude an infective cause, and symptomatic management with antipyretics and IV fluids is all that is usually necessary. Increasingly, patients with ruptured AAA are offered EVAR as the first-line treatment. There are the potential advantages of avoiding general or deep anesthesia, preventing damage to abdominal structures, and minimizing bleeding from surgical dissection. There is still a risk of conversion to an open surgery, so the patients should be prepped as for an open repair. The preoperative anesthetic management should include a fast and focused evaluation, large-bore venous cannula, blood cross-match, and appropriate restrictive resuscitation (hypotensive hemostasis). Rapid infuser and cell salvage should be readily available, as well as inotropes/vasopressors and vasodilators. Arterial access should be obtained before the start of the procedure but without causing unnecessary delay. Sometimes secondary procedures such as embolectomy and femoral-femoral crossover grafting may be necessary. EVAR was associated with lower short-term mortality but this benefit did not persist at the intermediate and long-term follow-ups. Patients undergoing EVAR have a higher incidence of major comorbidities and should undergo thorough preoperative assessment and optimization prior to the procedure in multidisciplinary settings. A distinction should be made between simple infra-renal EVAR and complex supra-renal EVAR which carries a higher perioperative risk. Anesthetic preparation should be carried out with the awareness that there is a risk of major hemorrhage and conversion to an open procedure can occur at any stage. Good teamwork and communication are essential when performing EVAR and this is even more vital during emergency EVAR. As the scope and complexity of these procedures continue to advance, anesthesiologists are assuming an increasingly important role in the multidisciplinary management of these cases. A comprehensive understanding of these procedures is essential to provide a high level of anesthetic care and maintain patient safety. Norris EJ. Perioperative management of the patient undergoing aortic vascular surgery. ASA Refresher 2005;16:187-202. Gillum RF. Epidemiology of aortic aneurysm in the United States. J Clin Epidemiol 1995;48:1289-98. White CJ, Gray WA. Endovascular therapies for peripheral arterial disease: An evidence-based review. Circulation 2007;116:2203-15. Parodi JC, Palmaz JC, Barone HD. Transfemoral intraluminal graft implantation for abdominal aortic aneurysms. Ann Vasc Surg 1991;5:491-9. Volodos NL, Karpovich IP, Troyan VI, Kalashnikova YuV, Shekhanin VE, Ternyuk NE, et al. Clinical experience of the use of self-fixing synthetic prostheses for remote endoprosthetics of the thoracic and the abdominal aorta and iliac arteries through the femoral artery and as intraoperative endoprosthesis for aorta reconstruction. Vasa Suppl 1991;33:93-5. Rutherford RB, Krupski WC. Current status of open versus endovascular stent-graft repair of abdominal aortic aneurysm. J Vasc Surg 2004;39:1129-39. Prinssen M, Verhoeven EL, Buth J, Cuypers PW, van Sambeek MR, Balm R, et al. A randomized trial comparing conventional and endovascular repair of abdominal aortic aneurysms. N Engl J Med 2004;351:1607-18. Clair DG, Gray B, O′hara PJ, Ouriel K. An evaluation of the costs to health care institutions of endovascular aortic aneurysm repair. J Vasc Surg 2000;32:148-52. Lederle FA, Johnson GR, Wilson SE, Ballard DJ, Jordan WD Jr, Blebea J, et al. Rupture rate of large abdominal aortic aneurysms in patients refusing or unfit for elective repair. JAMA 2002;287:2968-72. National Institute for Health and Clinical Excellence (NICE). Endovascular Stent-Grafts for the Treatment of Abdominal Aortic Aneurysms; 2009. Available from: http://www.nice.org.uk/guidance/ta167/resources/guidance- endovascular-stentgrafts-for-the-treatment -of-abdominal-aortic-aneurysms-pdf. [Last accessed on 2015 Apr 13]. Steinmetz EF, Buckley C, Shames ML, Ennis TL, Vanvickle-Chavez SJ, Mao D, et al. Treatment with simvastatin suppresses the development of experimental abdominal aortic aneurysms in normal and hypercholesterolemic mice. Ann Surg 2005;241:92-101. Dodd BR, Spence RA. Doxycycline inhibition of abdominal aortic aneurysm growth: A systematic review of the literature. Curr Vasc Pharmacol 2011;9:471-8. Sanchez LA, Marin ML, Veith FJ, Cynamon J, Suggs WD, Wengerter KR, et al. Placement of endovascular stented grafts via remote access sites: A new approach to the treatment of failed aortoiliofemoral reconstructions. 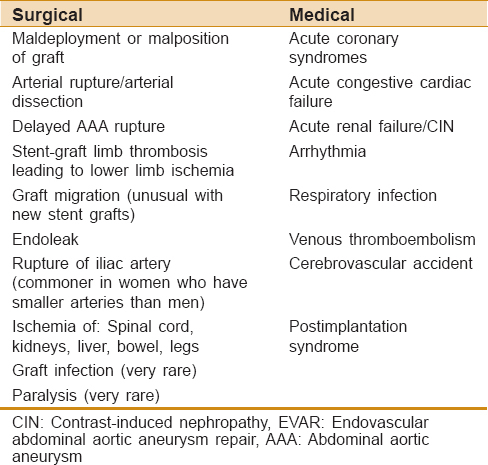 Ann Vasc Surg 1995;9:1-8. EVAR trial participants. Endovascular aneurysm repair versus open repair in patients with abdominal aortic aneurysm (EVAR trial 1): Randomised controlled trial. Lancet 2005;365:2179-86. EVAR trial participants. Endovascular aneurysm repair and outcome in patients unfit for open repair of abdominal aortic aneurysm (EVAR trial 2): Randomised controlled trial. Lancet 2005;365:2187-92. Laheij RJ, van Marrewijk CJ, Buth J, Harris PL; EUROSTAR Collaborators. The influence of team experience on outcomes of endovascular stenting of abdominal aortic aneurysms. Eur J Vasc Endovasc Surg 2002;24:128-33. Fleisher LA, Beckman JA, Brown KA, Calkins H, Chaikof E, Fleischmann KE, et al. ACC/AHA 2007 guidelines on perioperative cardiovascular evaluation and care for noncardiac surgery: Executive Summary: A Report of the American College of Cardiology/American Heart Association Task Force on Practice Guidelines (Writing Committee to Revise the 2002 Guidelines on Perioperative Cardiovascular Evaluation for Noncardiac Surgery): Developed in Collaboration With the American Society of Echocardiography, American Society of Nuclear Cardiology, Heart Rhythm Society, Society of Cardiovascular Anesthesiologists, Society for Cardiovascular Angiography and Interventions, Society for Vascular Medicine and Biology, and Society for Vascular Surgery. Circulation 2007;116:1971-96. Kertai MD, Boersma E, Klein J, van Sambeek M, Schouten O, van Urk H, et al. Optimizing the prediction of perioperative mortality in vascular surgery by using a customized probability model. Arch Intern Med 2005;165:898-904. Fleisher LA, Fleishmann KE, Auerbach AD, Barnason SA, Beckman JA, Bozkust B, et al. 2014 ACC/AHA guideline on perioperative cardiovascular evaluation and management of patients undergoing noncardiac surgery. A Report of the American College of Cardiology/American Heart Association Task Force on Practice Guidelines. J AM Coll Cardiol 2014;64:77-137. Prentis JM, Trenell MI, Jones DJ, Lees T, Clarke M, Snowden CP. Submaximal exercise testing predicts perioperative hospitalization after aortic aneurysm repair. J Vasc Surg 2012;56:1564-70. Hennis PJ, Meale PM, Grocott MP. Cardiopulmonary exercise testing for the evaluation of perioperative risk in non-cardiopulmonary surgery. Postgrad Med J 2011;87:550-7. Blankensteijn JD, de Jong SE, Prinssen M, van der Ham AC, Buth J, van Sterkenburg SM, et al. Two-year outcomes after conventional or endovascular repair of abdominal aortic aneurysms. N Engl J Med 2005;352:2398-405. Karthikesalingam A, Thrumurthy SG, Young EL, Hinchliffe RJ, Holt PJ, Thompson MM. Locoregional anesthesia for endovascular aneurysm repair. J Vasc Surg 2012;56:510-9. Edwards MS, Andrews JS, Edwards AF, Ghanami RJ, Corriere MA, Goodney PP, et al. Results of endovascular aortic aneurysm repair with general, regional, and local/monitored anesthesia care in the American College of Surgeons National Surgical Quality Improvement Program database. J Vasc Surg 2011;54:1273-82. Geisbüsch P, Katzen BT, Machado R, Benenati JF, Pena C, Tsoukas AI. Local anaesthesia for endovascular repair of infrarenal aortic aneurysms. Eur J Vasc Endovasc Surg 2011;42:467-73. Wax DB, Garcia C, Campbell N, Marin ML, Neustein S. Anesthetic experience with endovascular aortic aneurysm repair. Vasc Endovascular Surg 2010;44:279-81. Walsh SR, Bhutta H, Tang TY, Nunn DL, Armon MP, Clarke JM, et al. Anaesthetic specialisation leads to improved early- and medium-term survival following major vascular surgery. Eur J Vasc Endovasc Surg 2010;39:719-25. Verhoeven EL, Cinà CS, Tielliu IF, Zeebregts CJ, Prins TR, Eindhoven GB, et al. Local anesthesia for endovascular abdominal aortic aneurysm repair. J Vasc Surg 2005;42:402-9. Henretta JP, Hodgson KJ, Mattos MA, Karch LA, Hurlbert SN, Sternbach Y, et al. Feasibility of endovascular repair of abdominal aortic aneurysms with local anesthesia with intravenous sedation. J Vasc Surg 1999;29:793-8. Park WY, Thompson JS, Lee KK. Effect of epidural anesthesia and analgesia on perioperative outcome: A randomized, controlled Veterans Affairs cooperative study. Ann Surg 2001;234:560-9. Ruppert V, Leurs LJ, Steckmeier B, Buth J, Umscheid T. Influence of anesthesia type on outcome after endovascular aortic aneurysm repair: An analysis based on EUROSTAR data. J Vasc Surg 2006;44:16-21. De Virgilio C, Romero L, Donayre C, Meek K, Lewis RJ, Lippmann M, et al. Endovascular abdominal aortic aneurysm repair with general versus local anesthesia: A comparison of cardiopulmonary morbidity and mortality rates. J Vasc Surg 2002;36:988-91. Bettex DA, Lachat M, Pfammatter T, Schmidlin D, Turina MI, Schmid ER. To compare general, epidural and local anaesthesia for endovascular aneurysm repair (EVAR). Eur J Vasc Endovasc Surg 2001;21:179-84. Jean-Baptiste E, Hassen-Khodja R, Bouillanne PJ, Haudebourg P, Declemy S, Batt M. Endovascular repair of infrarenal abdominal aortic aneurysms in high-risk-surgical patients. Eur J Vasc Endovasc Surg 2007;34:145-51. Carpenter JP, Fairman RM, Barker CF, Golden MA, Velazquez OC, Mitchell ME, et al. Endovascular AAA repair in patients with renal insufficiency: Strategies for reducing adverse renal events. Cardiovasc Surg 2001;9:559-64. Hua HT, Cambria RP, Chuang SK, Stoner MC, Kwolek CJ, Rowell KS, et al. Early outcomes of endovascular versus open abdominal aortic aneurysm repair in the National Surgical Quality Improvement Program-Private Sector (NSQIP-PS). J Vasc Surg 2005;41:382-9. Solomon R, Werner C, Mann D, D′Elia J, Silva P. Effects of saline, mannitol, and furosemide to prevent acute decreases in renal function induced by radiocontrast agents. N Engl J Med 1994;331:1416-20. Bader BD, Berger ED, Heede MB, Silberbaur I, Duda S, Risler T, et al. What is the best hydration regimen to prevent contrast media-induced nephrotoxicity? Clin Nephrol 2004;62:1-7. Lewington A, MacTier R, Hoefield R, Sutton A, Smith D, Downes M. On Behalf of the Renal Association, British Cardiovascular Intervention Society and the Royal College of Radiologists. Prevention of Contrast Induced Acute Kidney Injury (CI-AKI) in Adult Patients. Available from: http://www.renal.org/docs/default-source/guidelines-resources/joint-guidelines/Prevention_of_Contrast_Induced_Acute_Kidney_Injury_CI-AKI_In_Adult_Patients.pdf. [Last accessed on 2015 Apr 16]. Adolph E, Holdt-Lehmann B, Chatterjee T, Paschka S, Prott A, Schneider H, et al. Renal Insufficiency Following radiocontrast exposure trial (REINFORCE): A randomized comparison of sodium bicarbonate versus sodium chloride hydration for the prevention of contrast-induced nephropathy. Coron Artery Dis 2008;19:413-9. Ozcan EE, Guneri S, Akdeniz B, Akyildiz IZ, Senaslan O, Baris N, et al. Sodium bicarbonate, N-acetylcysteine, and saline for prevention of radiocontrast-induced nephropathy. A comparison of 3 regimens for protecting contrast-induced nephropathy in patients undergoing coronary procedures. A single-center prospective controlled trial. Am Heart J 2007;154:539-44. ACT Investigators. Acetylcysteine for prevention of renal outcomes in patients undergoing coronary and peripheral vascular angiography: Main results from the randomized Acetylcysteine for Contrast-induced nephropathy Trial (ACT). Circulation 2011;124:1250-9. Rockman CB, Riles TS, Landis R. Lower extremity paraparesis or paraplegia subsequent to endovascular management of abdominal aortic aneurysms. J Vasc Surg 2001;33:178-80. Bajwa A, Davis M, Moawad M, Taylor PR. Paraplegia following elective endovascular repair of abdominal aortic aneurysm: Reversal with cerebrospinal fluid drainage. Eur J Vasc Endovasc Surg 2008;35:46-8. Lioupis C, Tyrrell M, Valenti D. A report of spinal cord ischemia following endovascular aneurysm repair of an aneurysm with a large thrombus burden and complex iliac anatomy. Vasc Endovascular Surg 2010;44:56-60. Kwok PC, Chung TK, Chong LC, Chan SC, Wong WK, Chan MK, et al. Neurologic injury after endovascular stent-graft and bilateral internal iliac artery embolization for infrarenal abdominal aortic aneurysm. J Vasc Interv Radiol 2001;12:761-3. Reid JA, Mole DJ, Johnston LC, Lee B. Delayed paraplegia after endovascular repair of abdominal aortic aneurysm. J Vasc Surg 2003;37:1322-3. Berg P, Kaufmann D, van Marrewijk CJ, Buth J. Spinal cord ischaemia after stent-graft treatment for infra-renal abdominal aortic aneurysms. Analysis of the Eurostar database. Eur J Vasc Endovasc Surg 2001;22:342-7. Peppelenbosch N, Cuypers PW, Vahl AC, Vermassen F, Buth J. Emergency endovascular treatment for ruptured abdominal aortic aneurysm and the risk of spinal cord ischemia. J Vasc Surg 2005;42:608-14. Szilagyi DE. A second look at the etiology of spinal cord damage in surgery of the abdominal aorta. J Vasc Surg 1993;17:1111-3. Eagleton MJ, Greenberg RK. Spinal and visceral ischemia after endovascular aortic repair. J Cardiovasc Surg (Torino) 2010;51:71-83. Hnath JC, Mehta M, Taggert JB, Sternbach Y, Roddy SP, Kreienberg PB, et al. Strategies to improve spinal cord ischemia in endovascular thoracic aortic repair: Outcomes of a prospective cerebrospinal fluid drainage protocol. J Vasc Surg 2008;48:836-40. Ling E, Arellano R. Systematic overview of the evidence supporting the use of cerebrospinal fluid drainage in thoracoabdominal aneurysm surgery for prevention of paraplegia. Anesthesiology 2000;93:1115-22. Velázquez OC, Carpenter JP, Baum RA, Barker CF, Golden M, Criado F, et al. Perigraft air, fever, and leukocytosis after endovascular repair of abdominal aortic aneurysms. Am J Surg 1999;178:185-9. Cross KS, Bouchier-Hayes D, Leahy AL. Consumptive coagulopathy following endovascular stent repair of abdominal aortic aneurysm. Eur J Vasc Endovasc Surg 2000;19:94-5. Rayt HS, Sutton AJ, London NJ, Sayers RD, Bown MJ. A systematic review and meta-analysis of endovascular repair (EVAR) for ruptured abdominal aortic aneurysm. Eur J Vasc Endovasc Surg 2008;36:536-44. Mayer D, Pfammatter T, Rancic Z, Hechelhammer L, Wilhelm M, Veith FJ, et al. 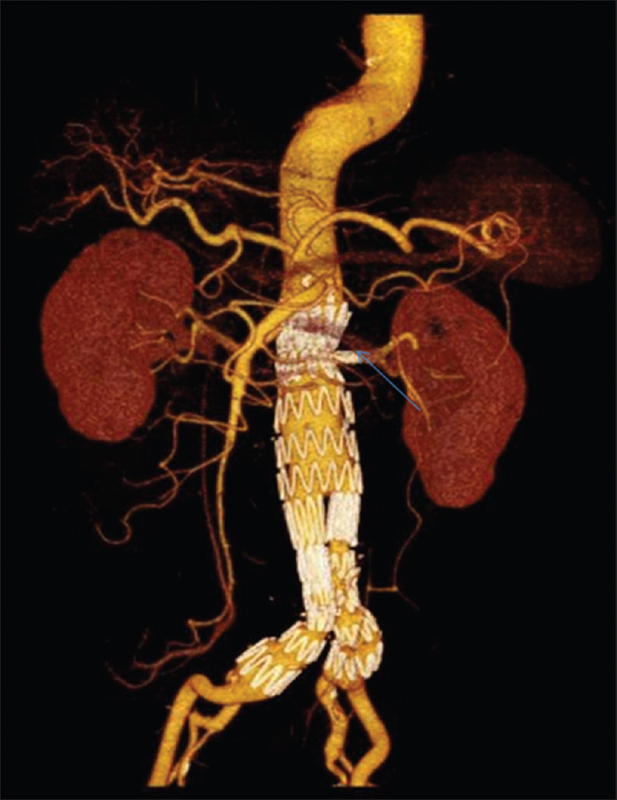 10 years of emergency endovascular aneurysm repair for ruptured abdominal aortoiliac aneurysms: Lessons learned. Ann Surg 2009;249:510-5. IMPROVE Trial Investigators, Powell JT, Sweeting MJ, Thompson MM, Ashleigh R, Bell R, et al. Endovascular or open repair strategy for ruptured abdominal aortic aneurysm: 30 day outcomes from IMPROVE randomised trial. BMJ 2014;348:f7661. Reimerink JJ, Hoornweg LL, Vahl AC, Wisselink W, van den Broek TA, Legemate DA, et al. Endovascular repair versus open repair of ruptured abdominal aortic aneurysms: A multicenter randomized controlled trial. Ann Surg 2013;258:248-56.